Check here to receive our newsletter blog. A slope stability analysis requires a comprehensive understanding of the interplay between moisture, soils, structures, and gravity. All it takes is good eyesight to detect the warning signs of slope instability — erosion, tension cracks, tilting trees — but determining what to do about them is another matter altogether. A slide damages a road, building, or other structure, and owners or agencies need help figuring out how to shore up the slope and prevent future slides. Visible cracks warn of an impending slide and people need guidance on diagnosing the cause and reducing the risk of a slide. A construction site includes a slope and the site engineers need to know how steep the slope can be. Each slope is subject to the unique characteristics of its gradient, underlying soil and rock, and moisture content. Any roadway or building on the slope adds to the complexity of the stability equation. Furthermore, geographic regions have distinct soil characteristics that make them either prone to slides or resistant to them. 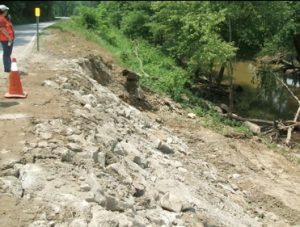 Heavy spring rains in Belmont County, Ohio, near the state’s eastern border produced a 4,000-cubic-yard landslide that wiped out a 650-foot stretch of SR 147. This area, an Ohio River backwater basin with deep soils that make it vulnerable to slides, had shown minor slippage and creep in previous years. The Ohio Department of Transportation (ODOT) needed a repair method that provided an alternative to the standard piling method because large auger rigs for piling were in short supply amid higher-than-usual road repairs in the Ohio Valley, and piling would be deep and expensive. 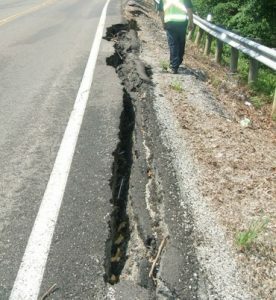 The state road agency confronted multiple emergencies in Lawrence County, Ohio, near the state’s southern border with West Virginia. ODOT selected the team of CTL Engineering, McCormick Taylor, and GPD Group to provide design services on a task-order basis. 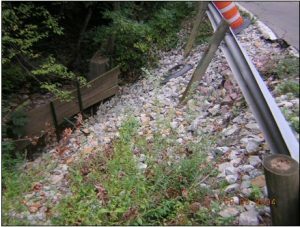 The required work included integrated survey, design, and geotechnical services to design repairs to sites damaged by recent flooding — including slips, washouts, and miscellaneous bridge and culvert work. With this knowledge in hand, we recommended that the city retain the slope by installing closely spaced drilled piles with soil arching between the piles. County Road 657, Lonaconing-Avilton Rd., located in Allegany Co., Maryland was being impacted by a massive landslide from an abandoned mine site. The mine site consisted of 30 feet of mine spoil that was saturated by an extensive underground mine complex. The landslide was approximately 400 feet in length and 30 feet high. CTL Engineering completed a reclamation project on the mine site and designed a 400-foot H-Pile and lagging wall. 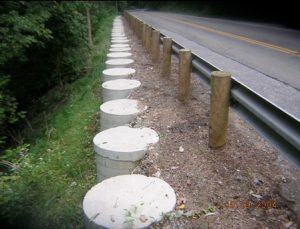 These were embedded 30 feet into the underlying bedrock in order to cut off the landslide movements and stabilize the upper hillside from laterally displacing the roadway. Landslides can take out busy highways, forcing travelers to reroute and threatening local businesses that depend on the road staying open. Heavy rains can cause massive mudslides that wreak havoc and cost lives. Evidence of substandard engineering, construction, and other work can help courts decide who is liable for the damages. A slope stability analysis can address all these issues and many more — provided it is done by experts who have broad experience in a diverse variety of soils, structures, and locales. Visual evaluation of a site to assess what needs to be investigated and to determine the project scope. In-depth study of the site’s geology and history, including a search on relevant literature on the site. Investigation of the slope including taking core samples to characterize its subsurface conditions. Modeling the slope to determine the most probable causes of failure. If a repair or prevention is needed, we help design it in conjunction with our client. Providing expert-witness services in court cases to establish the causes of slides and other damage. It’s crucial to assess all the potential points of failure on a slope — missing any of them can have expensive, painful consequences. That’s why is it’s crucial to work with experts like the ones we employ at CTL Engineering. Our engineers have decades of experience, advanced training, and state-of-the-art equipment. That’s the kind of expertise you need to assess slope stability risks and chart out repairs if needed. Anything less leaves too much to chance. Who would need asbestos testing and why? Our New “Digs” in Pennsylvania! All Contents © 2018 CTL Engineering Inc. All rights reserved.